I was doing some blissful antiquing in serene Palm Springs last week–my mind is much more at ease these days, if it’s not already obvious–and everything else in this particular booth was priced at $5, $10, & $20. But this immaculate pink, velveteen Jesus which I was smitten with was unmistakably marked with a price tag of $120. I asked a guy working on rearranging stuff for sale in his adjacent booth if he knew anything about the pink Jesus and he just laughed when I told him the price. As his two little dogs came over to be petted by me, he explained, “Oh, that’s Jack’s booth and that’s his idea of a joke. Take that pink Jesus on up to the register and the store owner will tell you the ‘real price. '” So I kept browsing, all the time wondering what in the Hades the real price was gonna be. Turns out the store owner laughed and said the same thing as the guy in the adjacent booth! 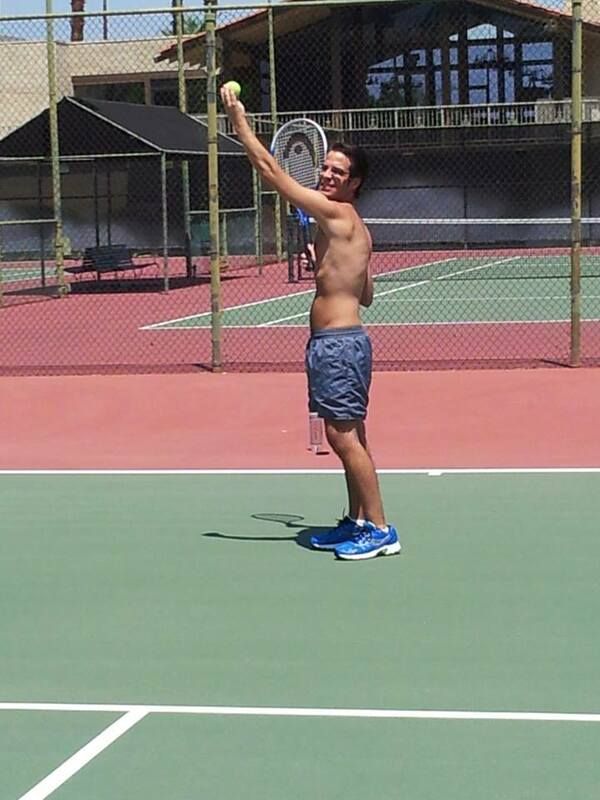 “Oh, that’s Jack. Name me a fair price on this pink Jesus and He’s all yours.” I said I’d pay $5 and the store owner replied, “Well you’re in luck because everything in Jack’s booth is 30% off, so you’re getting 30% off $5 on the pink Jesus today! And between you and me, the joke’s on Jack because I’ll tell him you didn’t argue with the price and that you paid 30% off $120 for it.” We both laughed as he rang up the pink Jesus and my other purchases. 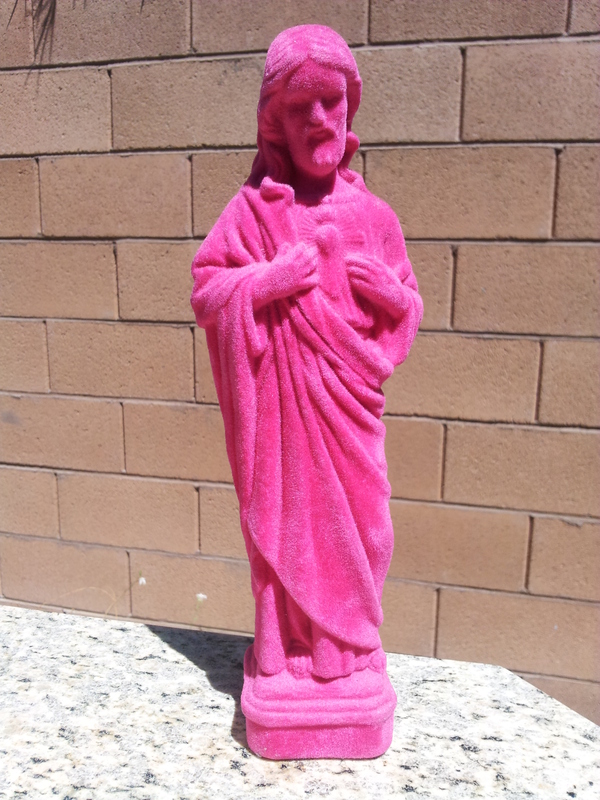 Alas, the $120 pink, velveteen Jesus was all mine for a mere $3.50. Suffice to say that my R&R in Palm Springs put a spring back in my step. A Palm Springs back in my step, if I’m trying to be punny. I must thank my friend Chris for letting me stay with him at his absolutely 70s-tastic apartment complex, and I mean that as the highest compliment. It was stunning and I had a ball on the tennis court, sweated out the toxins in the sauna, and spent much quality time soaking in the Jacuzzi. It was just what the doctor ordered, and when I saw both my doctors the day I got back into town, they could both tell I seemed much more at ease. My medical doctor wants me to start working out to relieve my stress; he also wants me to start journalling both my physical exercising and the reading and writing I do (AKA mental exercise). For whatever reason he’s taken a great interest in me having been an English major. I told my mother he reminds me of a slighter, balder Morgan Freeman; he has that same soothing voice and presence as well. My psychologist told me I’m making good progress, but that I need to make sure I’m not getting bogged down in the little things, especially other people’s issues. Which is true; I have enough issues of my own without trying to preoccupy or distract myself with other people’s drama. The bottom line goal is to be happy, but I told him my worst fears are ending up alone and/or losing my sanity. He reminded me that losing my sanity represents losing control, which is what alcohol was doing to my life. I was losing control of my life due to the chronic drinking, and I can finally accept that now. I finally, truly accept that. I’m going to end here this week. 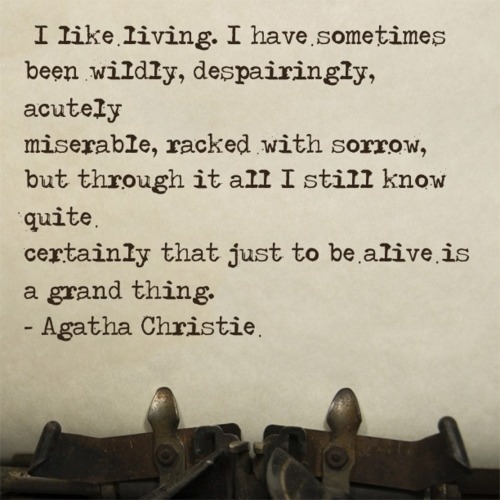 I still cry almost daily and want a drink almost daily, but as Agatha Christie said above, “…just to be alive is a grand thing.” And I certainly need more Jesus in my life, even if He is a pink, velveteen one that I got a deal on. Thanks for reading…and HAPPY 32ND BURFDAY TO MY LOVELY SEE-STER SUSANNE!